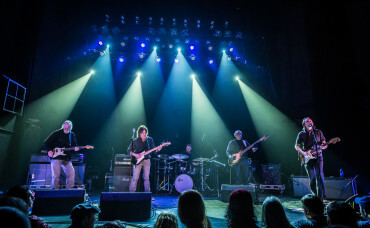 If one wants to talk about the most amazing groups of musicians currently playing together, at the top of the list is The Ringers, featuring Jimmy Herring, Wayne Krantz, Michael Landau, Gary Novak and Etienne Mbappe. The concept of The Ringers was to bring five guys together, not just to perform as a super-group, but to work together as a unifying artistic force; one in which people put music ahead of their egos to collectively create great music. These five veteran musicians will perform together, featuring new material written exclusively for this band, as well as each individuals’ solo material and cover tunes chosen by the players. Jimmy Herring, as the founding member of The Aquarium Rescue Unit, Project Z and Jazz is Dead (in addition to having played with everyone from The Allman Brothers Band, The Grateful Dead to Phil Lesh and Friends, and Bela Fleck) has made his indelible impact on the music world. He currently serves as the lead guitarist for the very popular American Band, Widespread Panic and released his second solo album, Subject To Change Without Notice. Wayne Krantz released his tenth album, Howie 61, this past April to glowing critical praise. Krantz has played with Randy Brecker, Leni Stern and Steely Dan, among others. Through a succession of highly lauded solo recordings, Krantz has continuously evolved as an artist by pushing himself in new and exciting directions and is revered for his forward-thinking approach to improvisation. Michael Landau, musician and composer, is a prolific session guitarist and performer who has played on hundreds of records since the 1980s, some session highlights include: Pink Floyd, Miles Davis, B.B. King, Ray Charles, Joni Mitchell and James Taylor. He has toured with Robben Ford, the Steve Gadd Band, James Taylor, Joni Mitchell and his own project The Michael Landau Group. With many recordings under his name, the latest being ‘Organic Instrumentals’, his music flows intensely ranging from spooky ballads with beautiful improvisation to intense Rock ‘n’ Roll with vocals. Bass player Etienne Mbappe is best known for his years with the Zawinul Syndicate. In the 1980ís he was the centerpiece of the jazz fusion band Ultramarine which fused jazz with elements of African and Caribbean influences. Mbappe played with Ray Charles on his last album and is currently a member of John McLaughlin’s 4th Dimension. Gary Novak, an amazing drummer, began his career at the young age of 10, playing in his famous pianist father’s (Larry Novak) trio in Chicago. Novak has recorded and/or toured with such musical luminaries as Chick Corea, Alanis Morrisette, Allan Holdsworth, Andrew WK, Michael McDonald, Natalie Cole, David Sanborn, George Benson and Anita Baker along with many more.